With the Boston Bruins having six picks in the top-52 selections of the 2015 NHL Entry Draft and just five more scheduled for rounds 3-7 (the B’s moved their fifth-rounder to Minnesota in exchange for the Wild’s fifth in 2016), there hasn’t been a great deal of attention placed on the four players the team took later on. However, if the club believes that its first and second rounds will build a future foundation of promise, the selections of forwards Cameron Hughes and Jack Becker could tip the scales towards 2015 being a seminal draft class for this franchise. We have a long way to go before it can compare to Bruins hauls in 1979, 1980 and 2006, but the value and upside the team and others feel it got from this duo of raw-but-talented players is encouraging. Hughes, acquired with the 165th overall selection in the sixth round, came into the season with the promise of being a top-two round selection according to scouts. A product of the Spruce Grove Saints of the tier 2 Alberta Junior Hockey League (AJHL), the same club that brought Matt Benning to the 2012 draft, Hughes is a Western Canadian who passed on the traditional major junior route to play in the NCAA for the University of Wisconsin last season. That’s the kind of skill set that resonates with a team like Boston, whose president, Cam Neely, has talked repeatedly of infusing that “hard to play against” mantra back into the organization. The scout went on to say that he thinks Hughes arrived in Madison at about 140-150 pounds and the lack of strength showed. It isn’t that he didn’t get a lot of opportunities at first, but that the lack of physical readiness when playing against mostly 20-23-year-old men wore the 17-year-old true freshman down. Being on a poor team didn’t help Hughes much, either. Hughes demonstrated his impressive skill set at Boston’s development camp last week, standing out for many of the things the scout described, and as he grows and develops physically, watch for him to break out in a big way for the Badgers if not this year, certainly as a junior. Becker, who was Boston’s final selection in the seventh round at 195th overall, is a different animal from Hughes. The Mahtomedi High School (Minnesota) forward is the son of Russ Becker, whom the NY Islanders drafted in the 11th round, 228th overall in the 1984 NHL draft as a Virginia, Minnesota HS standout who went on to play at Michigan Tech. Cousin Aaron Miskovich was a 1997 Colorado Avalanche draft pick and had a brief pro career, so there are some bloodlines in the mix. Becker was felled by a bout with mononucleosis early in the season, usually a harbinger of a ruined year. But to Becker’s credit, after recovering from the illness, he came back strong to play his best hockey. Good friend and Red Line scout Dan Shrader saw Becker multiple times this season and smartly listed him in the RLR final rankings. Becker will spend a season in the USHL and then is off to Wisconsin where he might get an opportunity to team up with Hughes in the 2016-17 season. In all honesty, past trends show that you can’t bank on great production from players taken in the latter rounds of the NHL draft, but in Hughes and Becker, the B’s appear to have a duo that are only beginning to scratch the surface of their potential. As the old saying goes- time will tell. 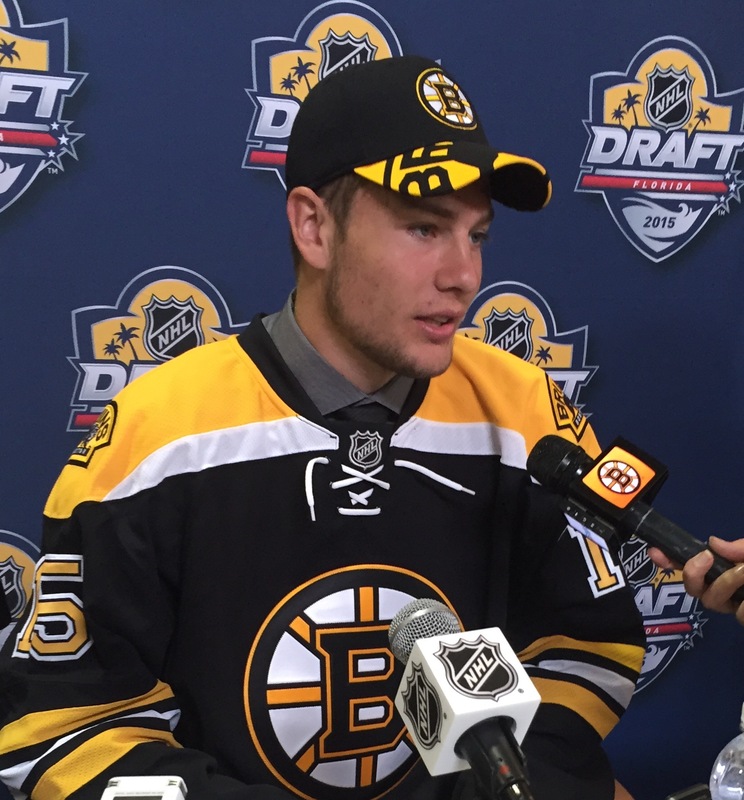 For obvious reasons, Jakub Zboril and Brandon Carlo are getting the most attention as the No. 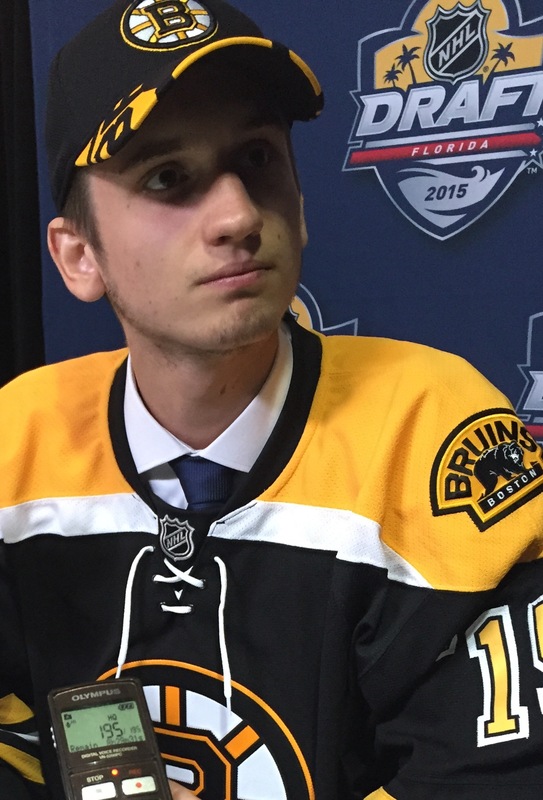 1 and 2 defensemen drafted by the Boston Bruins in 2015. 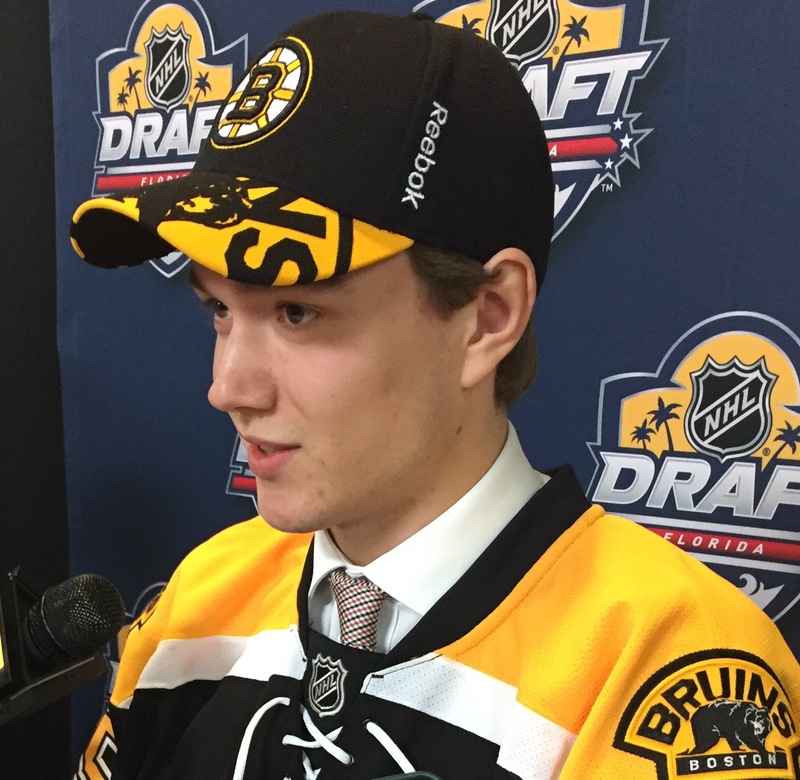 However, Jeremy Lauzon of the Rouyn-Noranda Huskies, chosen by the B’s with the second of two second-round picks acquired from Calgary in the Dougie Hamilton trade, could be the one player who goes on to have the best NHL career of the three. Lauzon was probably more under the radar than he should have been going into the draft, as he was the goals leader among all Quebec Major Junior Hockey League defensemen with 15 (he had a 12% shooting percentage as a 17-year-old, which should improve over the next two major junior seasons). This reminds a bit of Patrice Bergeron in 2003, who posted a solid season and was ranked 28th among North American skaters by the NHL’s Central Scouting Service, yet generated quizzical looks and in some circles- yawns- when the Bruins snapped him up at 45th overall. The rest, as they say, is history. As for that last sentence, it’s a very minor quibble, and who knows? By the time Lauzon is ready to compete for a job in Boston, the cup might runneth over in right-shot defenders and his left-side drive could be a welcome addition. Here’s what I like about the kid: He’s tough to play against. Too often, fans get dazzled by pure talent and skill, or fixate on production. Not that those things aren’t important- they most certainly are. But the rare player is the one who brings the skill and the passion/propensity to give their all and be a difficult opponent. This is what has made Bergeron (and no- I’m not just comparing them because they both were drafted out of the ‘Q’) so valuable to the franchise in his 12 years with the B’s, and let’s face it- had he been a great skater in 2003, they wouldn’t have had a prayer at drafting him in the middle of the second round because he would have been a household name in that deep class that will produce multiple Hall of Famers. That snippet accompanied Lauzon’s listing as RLR’s 4th-most underrated player entering the draft, so if RLR and the Bruins are right, the value looks pretty solid. He can skate, shoot, pass and score. He can defend. He’s a rugged player not afraid to take the body and fight if need be, though that’s not something he excels at. In short- he’s precisely the kind of player Boston fans value, so remember the name and keep track of him. In about three years, you might be glad you did. So, why might Lauzon be the best between Zboril (13th overall) and Carlo (37th overall)? Like Zboril, Lauzon brings similar size and a mix of offense and defense. He’s more of a consistent competitor in my view, despite some reports of Boston’s top choice being “ultracompetitive” (I wouldn’t go that far based on what I saw in film study). Carlo is a massive rearguard who excels in a shutdown role, but I don’t know that he has the offensive skill/sense to be much of a consistent points producer. That leaves Lauzon as the best combination of the three- not as talented as Zboril or as big/defensively savvy as Carlo, but solid across the board and a gritty, hard-to-play against -d-man. Here’s a good video profile done by John Moore of Sports by Moore back in October…you can get a sense of Lauzon’s fluid footwork/mobility, poise with the puck and check out the solid but clean hit he puts on a kid, dropping him near center ice. As Lauzon adds mass and gains strength, he’ll be able to impose himself more physically as he progresses up the ladder. Right now, Lauzon is seen as more of an afterthought by most because he wasn’t as known a commodity or one of the draft’s sexiest names going in. However, to get a player of Lauzon’s skill set and potential at 52 speaks to the quality and depth of the 2015 class overall.